Hot on the heels of the Pasta Pack comes the Lolly Pack. After buying this lot, I discovered that a $2 shop that we visit every now and then sells a huge range of lollies like this for less than I paid at a major supermarket chain. Arrgh! Yes, that is a bottle of Tabasco sauce in the middle. I know that it doesn't quite go with the theme of a lolly pack, but you packs what you can sends. 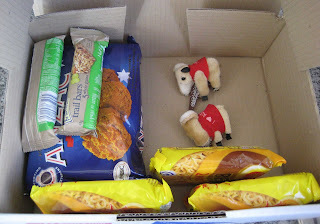 Lollies are surprisingly heavy, so I filled out the empty spaces in the box with some ANZAC biscuits, a few chewy bars and some 2 minute noodles. There was no room for the bag of Twisties, so the kids ate them. Soldiering is incredibly hard work - the guys in the field will be burning an amazing number of calories per day, so getting a face full of lollies is not an issue. If you can show me a soldier who comes back from Afghanistan heavier than when they left, I'll show you a cook. The rest will be so skinny, their pants will be falling down around their ankles. Now that I know where to buy masses of lollies at a good price, I am going to pay a return visit and buy enough to fill a couple of boxes. I know you would have thought of this, but pedantic me has to mention it-always check the use-by dates especially at the 2 dollar shops. :) That is some yummy haul of lollies! I like the idea of a sweets pack, i'll see how i go in the weight deparment. I'm thinking of doing one for the girls as well, any ideas for suitable magazines etc? P is for Pasta, Anyone?